Rockburn Cross, day 2 of the Howard County Double Cross and race #9 in the BikeReg.com MABRAcross series, takes place Sunday, November 21. 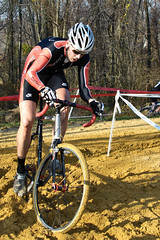 Twists, turns, ups and downs make Rockburn a favorite for many cyclocrossers in the Mid-Atlantic. Although there may be a different turn here and there, the word I get from the race organizers is that the course will not undergo any major changes for 2010. Back with us again for course commentary are the dynamic duo of Dan Tille (fulcrumcoaching.com) and Chris Mayhew (JBVcoaching.com). If you like the work these guys have done on the previews, let them know this weekend. Maybe even buy them a slice of pie. Mmmm pie. Chris will be a sporting a blue JBV Coaching kit and rocking the mic on Saturday at Schooley Mill. Dan will be decked out in the black and orange of Fulcrum Coaching and piloting the XXXL Guru cyclocross machine. We’re trying to extend the part of the loop prior to the sand pit. Some tweaks to the end of the course and re-entry to the road section as well. Most of the course will be the same as last year, however.